Listhus announces a call for artists for the Skammdegi Residency And Festival. Take the challenge of living with and respond to the dark, cold winter in north Iceland through any art form. Selected artists will have the opportunity to be secluded. Surrounded by mountains and snow, work in a quiet, creative space for ten weeks. This residency provides an excellent collaborative environment that encourages community engagement. 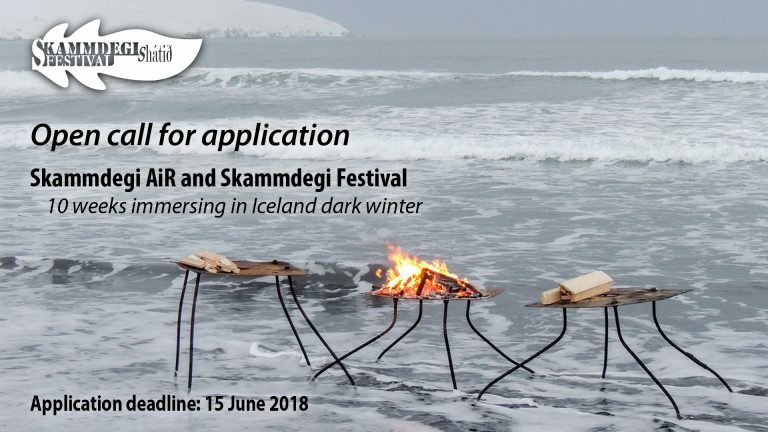 The Skammdegi Festival will be held from 15-18 February 2019 for the final presentation of the challenge. Skammdegi, in Icelandic, means the Dark Winter, a condition that is a yearly right of passage in this part of the world. At its darkest on December 21, the mysterious local daylight is present for less than four hours. The rest is night. Surrounded by mountains on three sides and looking directly at the Northern Atlantic on the other, Olafsfjordur, in North Iceland, is the uniquely beautiful location of Listhús. During the months of December and January, the sun never rises higher than the surrounding mountains. The land is covered by a mysterious light reflected from the snow-covered mountains. The atmosphere creates a special environmental and emotional challenge. Local people eager to raise their spirits in the long night light up their houses with colorful lights and celebrate the distinctive Icelandic Christmas traditions till January 6th. As the winter progresses, the sun gradually climbs the mountains until the first ray of sunshine glows on the highest local peak on January 21. By the end of the month, the sunshine will once again reach the town itself. Having recently completed its forth running, the Skammdegi Residency And Festival has formed a distinct character. It provides a hospitable environment and rare atmosphere for artists doing experiments that they cannot implement elsewhere. While the location is remote and doesn’t have the resources present in a larger city, artists feel the freedom of creation. The residency duration is long enough for artists to explore a new place, establish a new idea, and achieve its implementation. 1,500 euro: a double room with studio 15-20 sqm. Listhús SES. is a non-profit organization, run by a comprehensive team. It is not backed by public institutions. Activities are financed by the residency fee. There is no paid staff for daily operation. The residency fees are as low as possible. For more information, contact info@skammdegifestival.com.